It’s mid-March and it’s tourney time, the time of year when I find myself thinking back to my college hockey playing days. 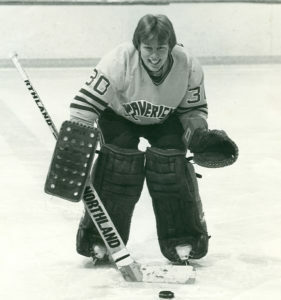 I was a goalie for Mankato State (now known as Minnesota State University, Mankato), where our team made four consecutive trips to the NCAA Division II National Tournament. You can see Coach Carroll playing in the national championship game in this video. Coach Carroll played four years at Minnesota State Mankato. The most memorable experience at the NCAA’s happened during my junior year. About a month after the U.S. shocked the world and won gold at the 1980 Olympics in Lake Placid, our team headed to New York in search of our own miracle. In the NCAA semifinals, we stunned the defending champions from Lowell University 8-1. That put us into the championship game against Elmira College, the school was hosting the tournament. There was about 5,000 fans at the championship game and it seemed like all but a couple dozen MSU parents, and fans were cheering for the Soaring Eagles. The game was recorded and televised on a new sports TV network called ESPN. The game was shown multiple times on the cable on a taped-delayed basis. While the final buzzer sounded, the Mavericks skated away with the upset victory, defeating Elmira 5-2 on their home ice — giving the Mavericks a Miracle in Mankato. It was a remarkable feeling to win the national title and I still have vivid memories from that night in New York. During my four years at MSU, we finished third in the country during my freshman year, second as sophomores, first as a junior and third as a senior). It was an awesome run! Great memories!